The start of the journey – staying in Buycherelles and Pont de Farcy. We left home at 10.30am on 23 July to travel to Folkestone for our first time through the Tunnel, courtesy of Tesco vouchers. The journey to Folkestone was a horrendous 7+ hours for the 278 mile trip. Unfortunately the traffic on the M25, travelling clockwise, was horrendous with frequent delays. Although we had tried to allow for this and we had to catch a later train. We missed our booked train at 16.50hrs but when we arrived at 18.00 were put on the 19.05 train without further charge. We had originally booked the Chunnel for 16.50 as we thought that would give us time to get to our first campsite La Chaumiere in the early evening. The Eurotunnel terminal was well designed with ample parking, including caravan spaces, and a good range of shops. 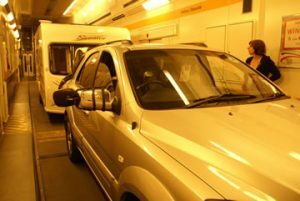 Our gas bottles were checked at the Eurotunnel check-in but we were waved through passport control without a glance! I was a little apprehensive about the train loading procedures but there was plenty of room to board. I remembered what had been said on Caravan Talk forum about ensuring that there was enough space before moving into the next train carriage and waited accordingly. We were last to board and left in a carriage on our own. Whilst the shuttle was very fast we were not otherwise impressed and decided we MUCH prefer the good old Norfolk Line ferry. 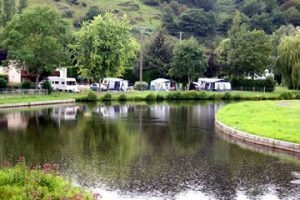 We had booked into Camping La Chaumiere, at Buycherelles for our first night. We had booked in advance from the UK, on the internet, and paid using the site’s PayPal facility. We were charged 21€ per night (including 1€ for the dog) plus a 3€ reservation fee. We had only intended a one night stay for our first night in France with a view to getting a good rest after our 270 mile drive down to Folkestone. We had planned to get away early the morning of Sunday 24 July. Our late departure from the UK, with the extra hour for French Summer Time, meant we did not arrive in France until nearly 21.00hrs. We phoned La Chaumiere to see if we could still arrive late and owner, Madame Bernadette, said “yes, no problem”. We drove to La Chaumiere via the A16, D11, D928 and then narrow country roads. The last mile or so was along a VERY narrow road with few passing places. Our late arrival in France meant that we did not reach La Chaumiere until about 21.50hrs. Husband Guy was NOT so helpful and accommodating as his wife and reprimanded us for our late arrival! The hedged pitch (No 9) we were shown to was large enough for our ‘van and car with room to spare. It had its own 6 amps EHU, rubbish bin, water point and drain. Access was good as it was at a junction of 2 site roads. The pitch was mainly grass with an area of “handstanding” for the caravan. The “hardstanding” was, however, very rough and uneven – more like builder’s rubble. The site is set in open countryside about a mile from the very small village of Buysscheure – a few houses, a Church and no shops. The site is quite small with fairly narrow site roads. The pitches are separated by quite high hedges and lots of trees which make most of the site rather dark and shady. There is a tiny outdoor pool which we did not try and a rather small pond for fishing. There is only one toilet block which does not seem much for the size of site. The bar and restaurant are at the entrance to the site and this, also, serves as reception. The restaurant which, also, has an outdoor terrace with picnic tables is open to non-residents and seemed very popular although we did not use it. There is, also, free wi-fi in the bar area, including the adjacent terrace. In addition the site has a children’s playground and areas for Boules, badminton and archery. There are 2 CDPs but at the one nearest to our pitches I was directed, by another camper, to the motor home dump point where the grating had to be removed with a metal tool. I have since read that there IS a CDP hidden in the bushes nearby but I didn’t see it. Using the motorhome point was not easy and a previous user had left pooh in the trap when I used it!!! The nearby TGV trains can be clearly heard but we did not find this a problem. Tired after the ordeal of the day before, we decided we would have an extra night at La Chaumiere to recover from our lengthy journey. On Sunday 24 July we drove over to St Omer to fill up with diesel as we had forgotten to stop for fuel the night before and arrived at La Chaumiere with the fuel warning light on. Fortunately we made it to nearest fuel available on a Sunday – the credit card pump at the Carrefour Hyper Marche at St Omer. We spent the Sunday afternoon visiting the nearby interesting town of Cassel. This hilltop town is reputedly on the hill which the “Grand Old Duke of York” marched up and down with his 10 thousand men. Its elevated position gives it outstanding views over surrounding flat countryside. It is very picturesque and has some interesting buildings. 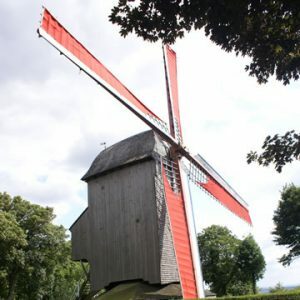 We visited the historic, working, post windmill set in the hilltop park near the town centre. The guide spoke only French but we were given an information sheet in English. At the end of our visit we were presented with a complimentary bag of flour, milled in the windmill. The extensive cobbled streets were very hard on the car suspension. On the morning of Monday 25 July we left at c09.00hrs for the first stage of our journey to Brittany. 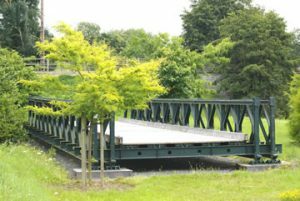 We stopped at Aire de Bai de Somme for a picnic lunch – Oh that UK motorway service areas were like that one! We parked our outfit in the separate, dedicated caravan parking area and used one of the adjacent picnic benches. The main buildings of the Aire can be reached from the caravan parking area by a footpath through the surrounding wetlands. The central buildings include a restaurant, general shop and a shop linked to the local wetlands. There is, also, a viewing tower which gives an excellent view of the surrounding countryside. After Lunch continued our journey south on the A16 and then turned onto to the toll-free A28/E402. At the intersection with the toll-autoroute A29/E44 we turned west towards the Pont du Normandie thus avoiding Rouen. 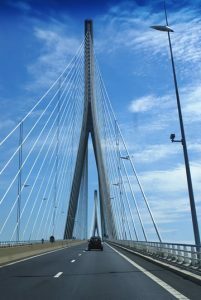 We drove over the spectacular Pont du Normandie and on south through eastern Normandy. At the intersection with the E46/A13 we turned southwest towards Caen. We bypassed Caen on its southern side on the N813 before turning southwest on the toll-free A84/E03 towards Avranches. Our next stop was at the Municipal Campsite at Pont de Farcy. We reached the site in the late afternoon having driven 242 miles from Camping La Chaumiere. The site is located south west of Caen just off the A84. It is literally 5 minutes’ drive from Junction 39 of the A84, from which it is signposted, thus making it ideal as a night halt. We did not book the site but we phoned ahead whilst travelling to ensure they had room. The site is set in a beautiful wooded valley and on a bend in the River Vire. I think the location may have previously been a boat quay as there are some remnants of this and the river widens into a basin. The site is fairly narrow and extends along the banks of the river with many of the pitches separated from the river bank only by a low fence. There are approximately 50 open, grass pitches with plenty of shade from mature trees. The site is a little unkempt in appearance with a number of pitches where the grass was in need of cutting – this was particularly so in the half of the site furthest from the entrance and reception, which was predominantly empty. There was a large, modern sanitary block with separate male and female toilets and laundry and washing-up area. This block, also, had an upstairs games room but this was not open during our stay. The CDP was located in a tiny, older sanitary block at the far end of the site but the toilets in this block were boarded up. There was a new children’s playground near the toilet block and a number of single pieces of children’s play equipment distributed around the site – although some of these had seen better days. The village tennis courts and crazy golf course are situated next to the gates of the campsite. River fishing was available at the campsite and a card could be purchased from Reception. It must be said that the whole site appeared to be in need of a little more loving care but its idyllic location compensated for this. We were told to choose our own pitch and chose one right on the bend in the river so that we were able to point the ‘van towards the river and have the views in both directions along the river. The views along the wooded valley were lovely with horses and foals gambolling in the fields on the opposite bank of the river. There was a nearby water point but a slight disadvantage was that the EHU point was on the opposite side of the site access road so we had to run our hook-up cable across the road. In addition we needed to use our additional hook-up cable to reach the EHU point. Although roads bordered the site on 3 sides they were relatively quiet country roads and traffic noise was not obtrusive. Surprisingly, given the site’s closeness to the autoroute, there was no road noise whatsoever from the A84. The small, picturesque village was 5 minutes’ walk away. It had a baker’s, bar and a petrol station with a very well-stocked food shop. The fuel was, however, very expensive – the dearest purchased during our 4 week holidays. Bread could be ordered and collected from reception. Opposite the campsite was a small “park”, unfortunately a little overgrown, where a WW2 Bailey Bridge had been relocated. We visited this by walking through the village and over the flower-decked bridge on the morning of our departure. I can highly recommend this rural campsite both as a night halt and for longer stays to explore the area. I hope that this review will help it to get more visitors as it deserves – that might help to smarten it up a bit. 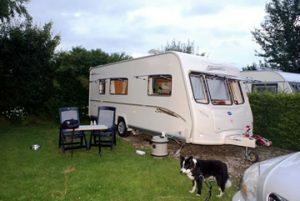 At £9.95 per night for the pitch with EHU for the 2 of us and Max the collie it was tremendous bargain, too.